This is our summer dish. I make this for Chris and me just about every week while beautiful heirloom tomatoes crowd the farmers market. It's a fast, fresh and very satisfying dinner. Perfect for Sunday evenings with a glass of wine. Over the years, I've made small tweaks to the recipe. I didn't used to toast the bread cubes, but doing so brings out their flavor. I've also recently started mashing garlic and anchovies for the dressing, which give it more character. Don't buy the cheapest ones. I used to get the kind that comes in a thin can, but I don't think they are very good. Instead, I now buy them in small jars, available at Whole Foods. This has the added benefits of providing a resealable container for keeping the rest in the fridge. Rinse them. Anchovies are kept in salt brine. Tossing them in like that is nasty (I had a restaurant serve me a Caesar salad once with unrinsed anchovies; it was almost inedible). Run water over the fillets and pat them dry. Easy and key. 1. Preheat broiler for 10 minutes with oven rack about 8 inches from broiler. Spray bread cubes liberally with olive oil (or toss bread cubes with 1 or 2 tbsp. olive oil). Broil until tops of bread cubes are browned, about 2 minutes, turn over, and broil another minute. Set aside to cool. 2. In small bowl, mash the garlic and anchovies into a paste. Add the olive oil, red wine vineger and pepper and whisk together. 3. In a large bowl, combine the toasted bread cubes, tomatoes, mozarella, cucumber, olives, onion and basil. Add the dressing and toss to combine. Serve topped with chives. I'm eating anchovies?!? Just kidding. 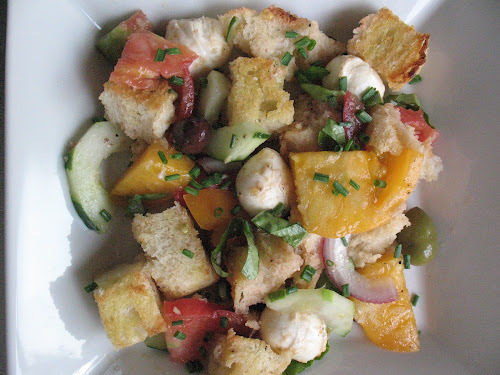 I knew you were including anchovies in our panzanella and have come to appreciate them. I also like the toasted bread cubes. Great innovation!